The world is awash with wild theories, conjecture and speculation about everything you could imagine — and then some. However, one theory that popped up some time ago stands out due to its unexpected curiosity: Earth is enlarging — in the way a pumpkin both balloons and adds mass. Could this theory offer one simple explanation for the current distance between Earth’s continents, and the death of the dinosaurs — without involving a Hollywood-size asteroid — and turn the long-held notion of India smashing into Asia on its head? Is it merely a coincidence that you can reassemble the continents into a single supercontinent that would encase a much smaller Earth? 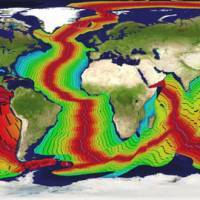 Growing Earth Theory says yes, yes, yes — and no; geology is not big on coincidences. Indeed, the prevailing explanation of how the continents came to be where they are today — Plate Tectonics Theory — was also generally dismissed by mainstream science until well into the 1950s. That theory, incidentally, draws on much the same data as Growing Earth Theory. Plate Tectonics Theory assumes the Earth has been about the same size since it was created some 4.5 billion years ago out of material thrown across space in the so-called Big Bang 13.7 billion years ago. That assumption has gained further traction due to a lack of evidence that our planet may have been smaller or may be growing according to the 18th-century Kant-Laplace nebular hypothesis about the formation of our solar system in an ever-expanding universe. On the other hand, as its name suggests, Growing Earth Theory has it that the Earth has grown over the eons — and indeed is still doing so. Start by taking a look at the complex makeup of this planet we inhabit. Earth is 40,000 km around the Equator. It has a solid iron-nickel inner core measuring about 70 percent the size of our moon. Around that inner core swirls an outer core of liquid metal, about 2,260-km thick, that generates Earth’s magnetic fields. This is all encased in a 2,980-km thick blanket of magma — semisolid rock kept just below its melting point by tremendous pressure bearing down on it from what is called the mantle. At points of weakness in this solid rock mantle, magma melts due to the reduced pressure and then escapes through it to the surface in a volcanic eruption. This is followed by the magma’s cooling or crystallization as it gradually becomes an additional part of Earth’s relatively thin crust. The mostly granite crust beneath the continental land masses is around 3.5 billion years old and averages 60- to 100-km thick, though it is deeper in some places. It is either resting on, or rooted into, the mantle. The crust beneath our oceans, however, is markedly thinner and younger. Consisting mostly of dense basalt (volcanic rock) and gabbro (crystallized basalt), it is only about 8- to 10-km thick and 200 million years old at most. Meanwhile, under our oceans and running almost entirely around the planet is a 65,000-km-long network of volcanic rifts, through which new volcanic material is being continuously added in an accepted process called sea-floor spreading. However, scientists favoring Plate Tectonics Theory maintain that this new material is not actually new, but is material that is recycled in a theoretical convective cycle called subduction. This cycle posits that the tectonic plates are moving and that they force the material down from the surface (or the mantle) back into the molten magma blanket — from where it eventually re-emerges. This analysis allows the surface of the planet to remain the same size. The problem with Growing Earth Theory, mainstream scientists say, is that it would require the creation of brand new matter — a mechanism for which they claim has not been confirmed and therefore is not accepted as happening. However, it probably doesn’t help that it also leads to a reassessment of the planet’s very evolutionary nature and, with it, humankind’s rise to dominance. All that aside, Growing Earth Theory, summarized in detail from here, is really quite simple and even explains a number of paleontological mysteries — but beware: this is the stuff many dismiss. The theory has it that, since the Archean Eon some 3.5 billion years ago, our planet has been ever so slowly growing in size and mass — and expanding radially outward like a balloon being inflated. In fact the theory states that, over the past 200 million years, Earth has approximately doubled in size and the rate of growth has also been slowly accelerating. During the Permian Period, from 300 million to about 250 million years ago, the annual rate of growth cited by the theory’s proponents was about the width of a human hair. Currently it is estimated to be about 22 mm a year — or some 2.2 meters every century. Certainly, widespread measurements have confirmed that the equator is expanding, but tectonic-plate theorists attribute that to what they call “polar flattening” — without explaining the rationale for that. Growing Earth Theory, however, winds the clock way back to when a supercontinental granitic crust was covering a half-size Earth like the shell of an egg. There were no large mountains or deep oceans in those times, just shallow seas, although about 70 percent of the surface was covered, as now, by water. Then, when the growth of the underlying mantle (due to forces not yet agreed upon), became more than the supercontinental crust could take, the volcanic fissures started to appear. These are the fissures that now underlie the ridges we see today in all the world’s oceans. We know that from these oceanic rifts there spews a continuous outpouring of volatile gases, mineral-rich water and molten rock up from the mantle — magma, just like from a volcano — which, when exposed to cold ocean water, crystallizes to begin forming a new, thinner crust. In the accepted process of sea-floor spreading, constantly erupted material settles and starts forming new crust while at the same time pushing older material away from the ridge with the helpful pull of gravity. All of our oceanic basins were formed this way. As this volcanic spreading pushed the continents apart, Growing Earth Theory has it that most of the ancient seas drained off the land masses and started forming the oceans. Indeed, it also holds that the volume of water, which, in a hydrogen-rich universe is readily produced (Enceladus, a moon of Saturn with a diameter of just 600 km, spews water from its southern pole), has increased in proportion to the amount of Earth’s growth — just as the planet’s gravity has increased along with its increased mass. In terms of mountain building, too, it’s interesting that none of the large, nonvolcanic mountain ranges on our planet, such as the Alps, Andes or Himalayas, are more than 100 million years old. In terms of geological time, that makes them quite recent arrivals. 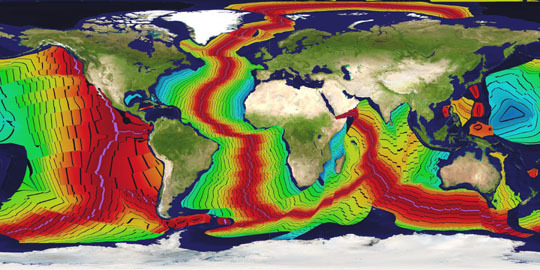 However, rather than attributing their formation to what would be an improbably rapid movement leading to the collision of tectonic plates — or to ancient shields (like that of the Indian subcontinent) breaking loose from the mantle and sliding about — Growing Earth Theory puts their formation down to folding and stacking resulting from sea-floor spreading. This has the effect of flattening the Earth’s curvature, but — because the Earth’s granite crust is so thick — it tends to retain its curvature as it can’t bend or stretch. Then as gravity tries to recurve it to the flattening surface of the growing planet, it cracks and breaks and throws up mountain-range-size ripples such as today’s Himalayas. For 160 million years until 65 million years ago, dinosaurs were the dominant species and roamed this planet unhindered by oceans, often migrating much as birds do today, Growing Earth Theory posits. Indeed, fossil evidence of like dinosaur species continue to be found on multiple continents now separated by oceans too vast to traverse. From the fossil record it has also been learned that the bones of dinosaurs had about the same density as animal bones do today, yet many dinosaurs were three or four times larger than any existing animals, yet were probably just as maneuverable. The reduced gravity on a smaller planet with less mass could well account for this, growing Earth theorists propose, as well as accounting for the significantly larger flora of that time. And as for the mass extinction of the dinosaurs in geologically short order, the theory has it that because they were the dominant species for so long, as oceans formed between the continents and climatic zones changed, their habitats and migratory life cycles were fatally disrupted. Moreover, the known decline of the dinosaurs coincides with the emergence of mammals, which both protect their eggs internally and will readily feed on those of other species (such as dinosaurs) left lying around. So the “terrible lizards” simply did not adapt fast enough as the Earth grew, and that is what killed them off — not some CG-like impact from outer space. There it is. We are growing from the seams as new crust is added at the undersea volcanic ridges. No need for giant rocks from outer space, runaway continents or credulity-straining subduction zones to consume and recycle epic masses of material. But if you remain skeptical, or just plain dogmatic, about Plate Tectonics Theory, the crustal-age map produced in 1996 by the U.S. National Oceanic and Atmospheric Administration may yet tip the balance. The colored bars on the map that are in the ocean areas represent various ages of the crust, as measured by what’s called radiometric dating of electromagnetic radioactivity in the rocks. For clarity, this rainbow of color has been further graduated down into segments of 10 million years. The pink and red areas in the very middle are the most recent additions to the Earth’s surface; the yellows, greens and then blues near the continental shelves represent the oldest. The data was originally compiled — paradoxically, to back up plate tectonics theory — because geologists and paleontologists could not find fossils in the deep oceans older than 70 million years. For those deft at visualizing 3D processes, working backward in time, progressively remove each age stripe on the map in your mind and close up the empty space to see our planet as Growing Earth Theory sees it back through the eons. Alternatively, simply cut up a world map and then reassemble the pieces on a smaller-size ball or globe. Few theories are without their flaws, but Growing Earth Theory certainly has a way of growing on you. Jeff Ogrisseg is a Tokyo-based journalist with an abiding interest in Earth sciences.